VertiGo is a lovely theme and one that is actually going to get used any minute now on my own little blog, simply because of the winter theme that comes with it as standard and the fact that I have quite a lot of snow outside. It's not just because there is a bit of snow in the theme, but because of the the effect they're using. It's called the Parallax Effect and it features layers of perspective based imagery, and the images move. 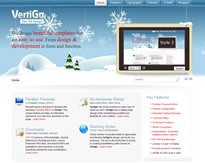 It really is very nice and from what I understand, RocketTheme are the first to use it in a Joomla theme. You also get all the usual stuff you'd expect from RT, the source file, tutorials, loads of sample styles to get you started, extensions and great support. Joomla 1.0+ version - for the last time! 1.0 & 1.5 Native RocketLauncher now available! - Deploy a replica of the Vertigo demo sites.